Free Beer and Free Tickets! Time to gear up for your summer adventures! Everything in the store is At Least 15% Off during our Annual Memorial Day Weekend Sale. Thursday - Monday, May 24th - 28th. Sale Prices limited to stock on hand. There is a Safety Recall on the Ortovox 3+ Avalanche Tranceiver. 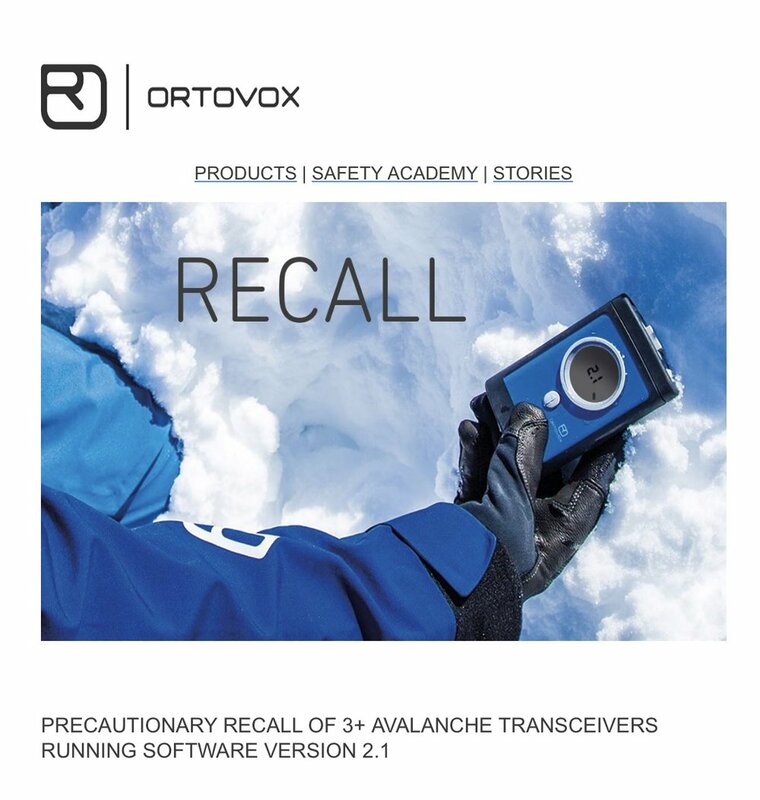 We have to inform you that there is a precautionary recall for the ORTOVOX 3+ avalanche transceivers running software version 2.1. Feedback from our SAFETY ACADEMY PARTNERS has revealed that, in some very rare situations, temporary disruption of the transmission function may occur on our 3+ avalanche transceivers running software version 2.1. This can lead to prolongation of the search process. The reason for the disruption is a software error. There have been no known accidents caused by the software error. However, as a precautionary measure to ensure our customers are not at risk, we are recalling all 3+ transceivers running software version 2.1. Devices affected by the recall may no longer be used without the required software update. Temporary disruption of the transmission signal’s pulse may occur on rare occasions. If this happens, the breaks between the transmission signals may be prolonged by a few milliseconds. If this happens when the device is being searched for, confusing messages may be temporarily displayed on the receiving transceiver. This may cause time to be lost in the search. This precautionary recall applies exclusively to ORTOVOX 3+ avalanche transceivers running software version 2.1. 3+ devices running the following software: 1.0, 1.1, 2.0, 2.2 – no matter what color – and all other ORTOVOX avalanche transceivers (S1+, S1, ZOOM) are not affected. HOW DO I KNOW WHICH SOFTWARE VERSION IS RUNNING ON MY ORTOVOX 3+? If 2.1 is displayed: YOUR DEVICE IS AFFECTED BY THE RECALL. If 1.1, 2.0 or 2.2 is displayed: Your device is NOT affected. If NO NUMBER is displayed, your device is running software version 1. This device is NOT affected. On our website you will find a video tutorial that clearly shows the individual steps. I STILL HAVE 3+ WITH SOFTWARE VERSION 2.1 IN STOCK: WHAT SHOULD I DO? In order to offer you uncomplicated shipping of the device(s), we ask you to use the recall form on our website (www.ortovox.com/recall-3plus) FROM MAY 25th, 2018 ONWARDS. Devices cannot be sent in any earlier. 'Explorers for Bats' is a 13-minute film by Dave McGowan of Ravenswood Media, who was awarded a small white-nose syndrome grant administered by Wildlife Management Institute on behalf of the U.S. Fish and Wildlife Service. The film asks climbers to report bat sightings and includes locations for staff of the National Park Service, U.S. Fish and Wildlife Service, Bureau of Land Management, U.S. Forest Service and nearby states. How does information about bat sightings help us? We are still learning about bats and where they hang out, especially in some places in the West. Learning where bats roost, forage, and hibernate will help us address white-nose syndrome. If I report a bat sighting, will the bats be disturbed? We always try to find the right balance between minimizing our disturbance of bats with collecting data to try to protect them. When climbers tell us where they see bats on big walls, we can learn from that to minimize future potential disturbances and the spread of the deadly WNS. Why are climbers such valuable sources of information? Climbers often reach places that scientists don’t commonly go, and they’re keenly observant of their surroundings while climbing. When climbers share where they’ve seen bats, scientists can visit that location and study the bats that live there. Climbers’ observations help us learn about and understand bats. If climbers report bat sightings, will the landowner close access to the route? Closing a climbing route is very unlikely. There are a few situations when that might be temporarily necessary. For example, if a maternity roost of an endangered species is discovered then a temporary seasonal closure may be necessary. This situation is similar to seasonal closures of certain climbing routes to protect nesting raptors. Local land managers make closure decisions. Store Wide Thanksgiving Weekend Sale. Everything in the store at Least 15% Off. Starts Friday morning at 9am, Ends Monday Night. Now Renting Cross Country Ski Equipment and Snowshoes! Grooming of trails has yet to begin. But there is enough snow to go cross country skiing or snowshoeing depending on where you want to go. We ARE recommending you take Bear Spray! We do not take reservations on rental gear. You CAN pick up your equipment the evening before and bring it back the morning after your excursion. Only $20 for a day a full XC Skiing package, and only $15 per pair of Snow Shoes. Avalanche Level 1 Discounted Course still has room! We still have room in the American Avalanche Institute Level 1 Avalanche course that we are sponsoring! Save$100 and have the knowledge to help save your life. Drop by Teton Mountaineering to get registered.